First, Śrī Rūpa categorizes the Vrajavāsīs according to their varṇa. Most of them are vaiṣya, but there are also some brāhmaṇa, and there are also śudra. In Vraja, there are three communities of vaiṣya. The higher class (vaiṣya) for cows. The middle class (ābhīra) cares for buffalo. The lower class (garjara) care for goats, sheep, etc. They don’t live much in Vraja, but a bit on the outskirts. But Śrī Rūpa gives a more pertinent way to categorize the Vrajavāsī into eight groups. The Rādhā Kṛṣṇa Gaṇodeśa Dīpika is organized around this 8-fold classification. Texts 14–69 describe the Superiors — They include all the parental figures in Vṛndāvana, as well as the brāhmaṇas (especially the main Guru of Vṛndāvana, Paurṇamāsī-devī). From there the book divides into two halves, the first being titled Bṛhat (“bigger”) and the second Laghu (“smaller”). The first part deals with most of the remaining seven categories of Vrajavāsīs as they pertain to Śrīmatī Rādhārāṇī, while the second part deals with them as they pertain to Śrīman Krishna-candra. Among the “friends” (Gopīs the same age as Krishna) there are exalted and more exalted groups. Texts 7697 describe the 8 more-exalted friends (Rādhārāṇī’s “aṣṭha-sakhī”). Texts 98–120 describe the 8 exalted friends. Texts 121–136 describe the activities of Rādhārāṇī’s friends. Text 164c.173 describes the “messengers” and their chief activities. Here, the organization become less clear because many gopīs from many groups play the role of messengers. Viśākhā and Raṅgā, for example, from Rādhārāṇī’s eight more-exalted friends, carry messages, and they are again described in texts 165 & 66. “Maids” also often act as messengers. Text 167 describes maids who dress Rādhikā. Some gopīs tend the forest groves under Vṛndā’s direction, Viśākhā and Campakalatā (from the most-exalted 8 friends) also tend the forests (and act as messengers) Texts 169172 describe Campakalatā. And since she is a super excellent cook, text 173 refers to other excellent cooks among the gopīs. Texts 174203 give further descriptions of the eight most-exalted friends, focusing on Citrā, Tuṅgavidyā, Indulekhā, Raṅgā, and Sudevī. Texts 204224 describe miscellaneous gopīs who are very important Vrajavāsīs. Texts 225229 describe the most important duties of the “messengers” — to arrange for the secret meeting of Rādhā and Krishna. Texts 230251 describe alternate ways of categorizing and counting the Gopīs. The first part of Rādhā-Kṛṣṇa Gaṇodeśa Dīpikā ends here. PART II (Laghu) Begins by describing what could be considered the 8th category from the original list: the beloved — Krishna. It elaborately describes him in 19 verses. Texts 20~ 72 Describe Krishna’s friends. There are four types: 1) Those who are older and thus more protective (this includes the “Siblings” category from the original list of 8). 2) Those who are the same age. 3) Especially beloved among them. 4) Especially beloved and confidential. Texts 22 ~ 27 describe Krishna’s protective, older friends. Texts 2829 describe Krishna’s friends, (“ordinary” or “same-age”). 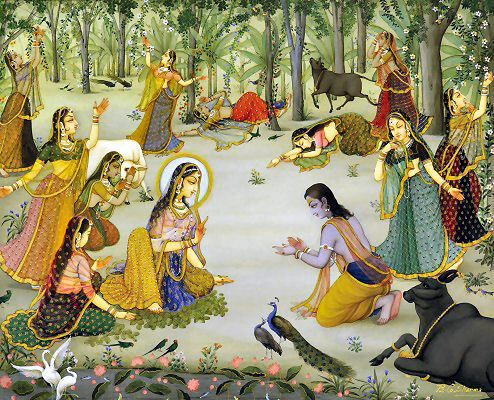 Texts 3034 describe Krishna’s especially beloved friends. Texts 3572 describe Krishna’s especially beloved and confidential friends. Balarāma (although older and also a protector) is also among this group, and several verses describe him. Text 73 describes “crafters” in relation to Krishna. Texts 86100 describe those who carry messages on behalf of Krishna. Texts 101108 describe Krishna’s “crafters” and the amazing things they craft for him. From here, things related to Krishna will be described. Texts 109111 describe Krishna’s pets! Texts 112118 describe special places in Vṛndāvana. Texts 119124 describe Krishna’s toys and accessories (including his flutes!). Texts 125132 describe Krishna’s jewelry. Text 133 defines his birthday. The entire rest of the book is focused on Śrīmatī Rādhārāṇī directly. Texts 134167 describe her in detail. Texts 168174 describe her family. Texts 175178 describe her friends. Texts 179181 describe her Mañjarī friends. Text 182 describes her religion! (She worships the Sun, her mantra is Krishna’s name, and her Guru is Bhagavatī Paurṇamāsī). Texts 183190 describe the gopīs in miscellaneous ways. Texts 191–196 describe Rādhārāṇī’s servants (parallel to the types of servants of Krishna described in 109111). Texts 197199 describe her pets! Texts 200206 describe her Jewelery, clothing, and cosmetics. Text 207 describes special places of hers. Text 208 describes her favorite singing rāgas (Mallāra and Dhanāśrī), and her favorite dancers. Text 209 defines her birthday. Text 210 ends the book.